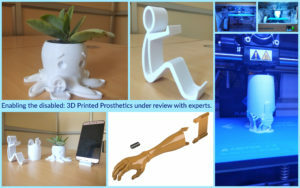 Under the community outreach program run at the school, students at Atal Tinkering Lab, Choithram School, Manik Bagh used 3D printer to make radically inexpensive prosthetics for under-served populations around the city. These prosthetics are now under testing by the CSR Club who donate these prosthetics. To start with, students created a chunk of other useful things like Mobile Phone Holder, Sapling Pot, etc using the 3D printer.